Two people suffered minor injuries after an aircraft swerved to avoid a “UFO” in the skies over Lake Ontario on Monday. 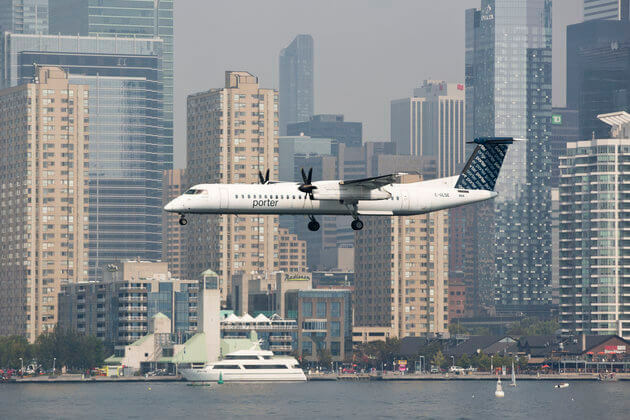 The Porter Airlines Dash 8 aircraft, which was carrying 54 passengers, encountered the object at about 9,000 feet as it descended into the Billy Bishop Toronto City Airport. “The pilots noticed an object in the distance (and) as they approached the object, they realized it was very close to their flight path,” Porter Airlines said in a statement, according to the Canadian Press. At first the pilots thought it was a balloon. However, after debriefing, they said the object could have been a drone. Two flight attendants were taken to an area hospital to be treated for minor injuries, the CBC reported. The Canadian government is now working to pass new rules to regulate the growing number of drones, and possibly help prevent incidents such as this one. There have been a number of close calls between aircraft and drones around the world, especially near airports. Earlier this year, a British Airways jet struck a drone while approaching London’s Heathrow Airport. No one was injured in that incident.